New Jersey Gov. Chris Christie dropped out of the Republican nomination for president on Wednesday, a day after his disappointing sixth-place finish in New Hampshire's primary. 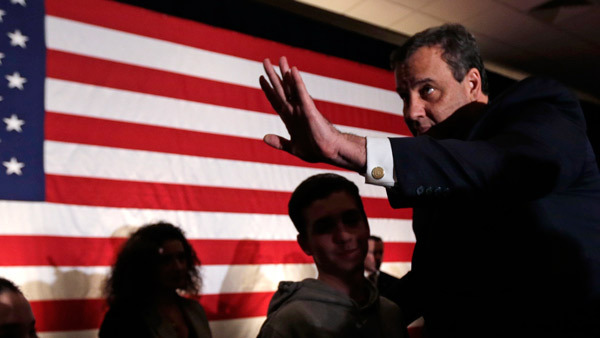 Christie on Tuesday night told supporters he was heading home to New Jersey to "take a deep breath," await the final tally of results from New Hampshire and decide what to do next. He said he was leaving New Hampshire "without an ounce of regret," but spoke of his campaign in the past tense at one point and cancelled a Wednesday event in next-to-vote South Carolina. Christie dropped out of the race the same day that Carly Fiorina announced on social media that she, too, was calling it quits. The former chief executive of Hewlett-Packard won just 4 percent of the vote in New Hampshire. Christie had 7 percent. But Tuesday's result appeared to be the final blow for a candidate whose campaign saw glimmers of hope at times, but had trouble from the get-go raising money and building support in a crowded Republican field dominated by another brash East Coaster, businessman Donald Trump. While Trump posed a challenge to the entire Republican field, his dominance seemed especially damaging to Christie, who had branded himself the "telling it like it is" candidate. Christie racked up a long list of notable endorsements from state legislative leaders in New Hampshire. At the end of 2015, he appeared to be breaking into the top tier after a video of him discussing a friend's struggle with drug addiction went viral. The terrorist attacks in Paris and San Bernardino in particular played to Christie's advantage, allowing him to talk about his previous job as a U.S. attorney and play up his law-and-order credentials. And a commanding performance during the last GOP debate before the New Hampshire primary earned him strong reviews. Christie may have missed a better chance at the White House four year ago, when some of his party's most powerful statesmen and donors begged him to run in 2012. But Christie declined, saying that he didn't feel like he was ready. Christie's aggressive political team worked to rack up endorsements and wide victory margins in his re-election bid for governor as a springboard for 2016. At the same time, his aides took their game of doling out political favors and punishments too far, leading to one of the most dumbfounding political scandals in recent memory. Aides purposely created traffic jams in the town of Fort Lee to punish the mayor, who chose not to endorse Christie's re-election. While Christie first laughed off the suggestion that his team had anything to do with the plot, the denials quickly unraveled following the release of emails, including one from a top aide that read, "Time for some traffic problems in Fort Lee."